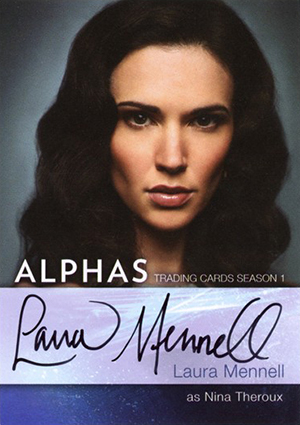 2013 Cryptozoic Alphas Season 1 trading cards are based on SyFy television show. Offering a mix of base cards, inserts, autographs and costume cards, the release promises an in-depth recap of the first 11 episodes. For those who haven't seen the show,Alphas takes place in a world inhabited by superhumans. The Alphas are a group of people who all have special powers and come together to solve crimes committed by other power-wielding bad guys. In a nutshell, think X-Men without tights and the fancy jet. The 2013 Cryptozoic Alphas Season 1 base set has 60 cards. They offer images as episode summaries. Collectors can look for randomly inserted Autographs and Wardrobe Cards, which have swatches from show-worn costumes. Both are inserted one per box. Dual Wardrobe cards fall approximately 1:4 boxes. A pair of basic insert sets, Alphas Team (seven cards) and Behind the Alphas (nine cards), round out the release. Sold separately, an Alphas binder comes with an exclusive costume card. 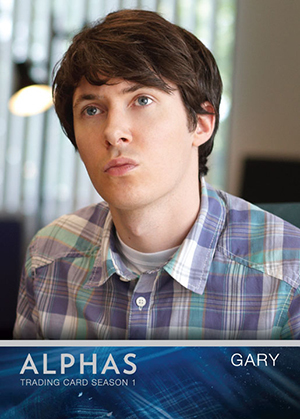 Alphas stars include Academy Award nominee, David Strathairn, Ryan Cartwright, Warren Christie, Azita Ghanizada, Laura Mennell and Malik Yoba. 11 cards. Inserted 1:24 packs. M11 exclusive to binder and not in packs. Good: Straightforward configuration, strong potential with autograph signers, clean designs. Bad: Very bland basic inserts. The Bottom Line: Summary Shortly after Cryptozoic announced they'd be making Alphas cards, the show was cancelled. This put the card maker in a tough spot. Already a show that didn't have a ton of followers was going to become even more obscure. Still, they pushed forward, delivering a solid release around the show's first season. There aren't a lot of headliners, particularly in the autographs, but this could easily be one of those sets down the line that could hit sleeper status. One would imagine the print run is lower than Cryptozoic's cornerstone franchises like The Walking Dead or Big Bang Theory. That said, this could be a set worth picking up now for an eye to the future. 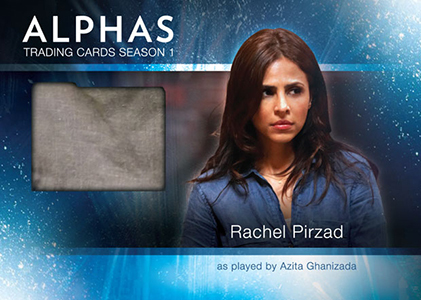 The 2013 Cryptozoic Alphas Season 1 design is nice. But it's also very plain once you get beyond the base cards. The main set has a vertical design with an image from the show on the front. It's anchored by a nice nameplate that has both the Alphas logo and a small caption. Card backs have a related shot and a decent write-up. Both of the set's basic insert sets are nearly identical to their base counterparts. The only notable enhancement for the Behind the Alphas set is that there are silver foil accents on the front. Similarly, the Alphas Team cards use a rainbow foil card stock with the same design. Cryptozoic continues to do a solid job with their autographs and costume cards. The balance nicely as far as room for signatures and swatches. An added bonus is that many of the signers took the time to include nice autographs rather than simply scribing a squiggle. Save for David Strathairn, the rest of the cast signed for the set. Sure, Strathairn is the show's biggest name, but there's a lot of potential with this list. The cast are already veterans of several other shows and films. Most should continue to find work. I look at this set as something similar to a prospecting set in sports cards. There's a lot of potential and getting in on the ground floor is relatively inexpensive. The entertainment card landscape is filled with guest stars who went on to become Hollywood A-listers. Just like sports, there are no guarantees but there is definitely some good potential. 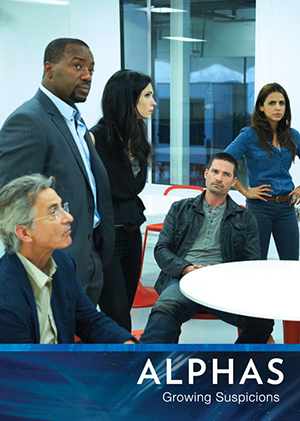 The rest of the release makes for a nicely rounded take on the first season of Alphas. 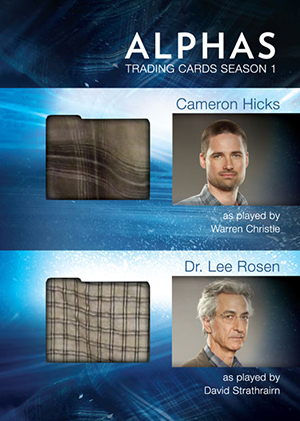 Strathairn shows up multiple times on the Wardrobe Card list. Unlike a lot of other TV releases as of late, 2013 Cryptozoic Alphas Season 1 won't deliver any $300 or $500 cards. But the hits are holding very nicely given the relatively low box price. For those looking to sell off some singles, you aren't going to make very much right now but you're not going to take a major hit either. As solid as Alphas is overall, busting a box isn't that exciting. The designs gets redundant. The small base set leads to more duplicates that normal. And with only two basic insert sets, there's not a lot of excitement there either. However, the possibility of additional hits in the form Dual Wardrobe cards adds some unpredictability even if you do hit all your bonus cards by the half-way point of the box. Some different designs and fewer packs per box could have worked in a less-is-more sort of approach here.